Chapter 18: "The Falcon Cannot Hear"
Summary: Discussing the fallout from Yuna's sphere. Our Story So Far: En route to the Al Bhed Home to ask Cid for aid, Isaaru's party learns the truth of the Final Summoning from Yuna's Sphere. Maroda and Auron come to blows, until Rikku intervenes. "What have you done to them?" Isaaru hurried towards his unconscious guardians, stumbling over his robes. "In Yevon's name—"
"Calm down. They're fine!" Rikku said, tapping the back of Auron's head. "Funguar pollen: works better than a hammer on skulls like his. They'll wake in a few. You'd better sit down till your head clears." The intercom activated with a burst of static. "Rikku, what are you doing to my ship?" Rikku pressed her hands over her ears. "Nothing, Gip. Maroda and Auron got into a fistfight. I hit 'em with a nightcap." "Oh, great. Hull breach? Dents in the deck?" "Ummm..." She lifted Auron's feet, first one and then the other, letting them drop with a clunk. "Nope!" Chapter 21: "Love Her and Despair"
Summary: Revelations from Yuna's pilgrimage. Our Story So Far: On a rampage to destroy the temples of Yevon, Sin transports Isaaru and companions to Bikanel Island, where Wakka and Rikku are raising a family. Gippal gives Isaaru's party a lift to the new Al Bhed Home. The flyer wobbled under the weight of extra passengers, accompanied by Rikku's swearing in two languages. Maroda rode white-knuckled, his brother with serene resignation. Elma, the machina-phobe, clung to her seat with a dour expression, but gave herself away with a whoop when the flier hopped over a sand-worm that unexpectedly rose behind a crumbling ruin. Auron simply played barnacle. Gippal was quiet too, for once, focused on steering a smooth course for the sake of his unsecured passengers. They were streaking towards a gray hump emerging from the dunes. The shape soon resolved itself into a bulbous, unlovely hulk of an airship with the profile of an oversized bathtub, its hull a crude patchwork of fins, engine pods, exhaust ports and mismatched panels. It was moored on the southern tip of the island with the bulk of its fuselage hanging over open water. An aft loading ramp extended down to the beach. The flyer slowed to a crawl and slithered up the ramp into the belly of the ship, coming to an abrupt halt against a stack of barrels. The engines screamed in the enclosed space, then faded to silence. Deafened passengers roused themselves and looked around. Floor-to-ceiling stacks of crates and gun racks loomed on all sides, making it a wonder they had not struck anything on the way in. "Well, here we are," Gippal said, hopping up onto the flyer's windshield to kick a knob on the wall. The ramp and cargo bay doors began to close with a hiss of hydraulics. Dingy amber lights flickered to life in the ceiling as the rectangle of daylight behind them narrowed and vanished. ...so I can find it later. 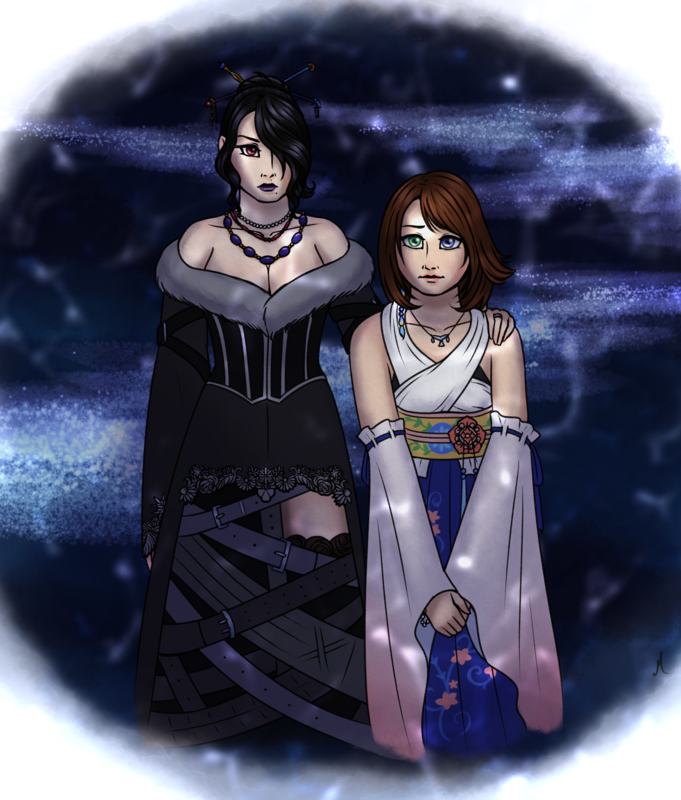 (Of course, I can look back on her dA as well). ...Rikku, Yuna and Lulu playing with each other's hair. And braids, because braiding hair (or having someone else braid one's hair) is fun and soothing. Chapter 41: "Sea of Sorrow"
Our Story So Far: The Crimson Squad brings down Sin using Vegnagun in an epic battle over the Thunder Plains. Now Summoner Isaaru's party must deal with what lies within. Our Story So Far: Sin has destroyed the fayth, and now only one thing can oppose it: Vegnagun, doomsday weapon from an ancient war. Auron and friends lure Sin to the Thunder Plains for a final showdown, where Auron hopes to distract Sin long enough to give Vegnagun one clear shot. Our Story So Far: Cid, possessed by Shuyin, has attacked Bevelle, and now seeks the doomsday weapon beneath the Tower of Light. Summoner Isaaru, his guardians and Rikku give chase. Chapter 29: "Illusions That Exalt Us"
Our Story So Far: Cid, possessed by Shuyin, has attacked Bevelle and forced his way into the palace. Summoner Isaaru, his guardians and Rikku give chase after stunning Maester Baralai and Captain Juno (Paine) when they bar the way. Our Story So Far: After Elder Cid is possessed by an angry, unsent ghost, Isaaru and his guardians must put their pilgrimage on hold to help the Al Bhed chase down Cid before he destroys Bevelle. Chapter 22: "The Falcon Cannot Hear"
Our Story So Far: En route to the Al Bhed Home to ask Cid for aid, Isaaru's party learns the truth of the Final Summoning from a sphere left behind by Yuna. Maroda and Auron come to blows over the sphere's revelations, until Rikku intervenes. 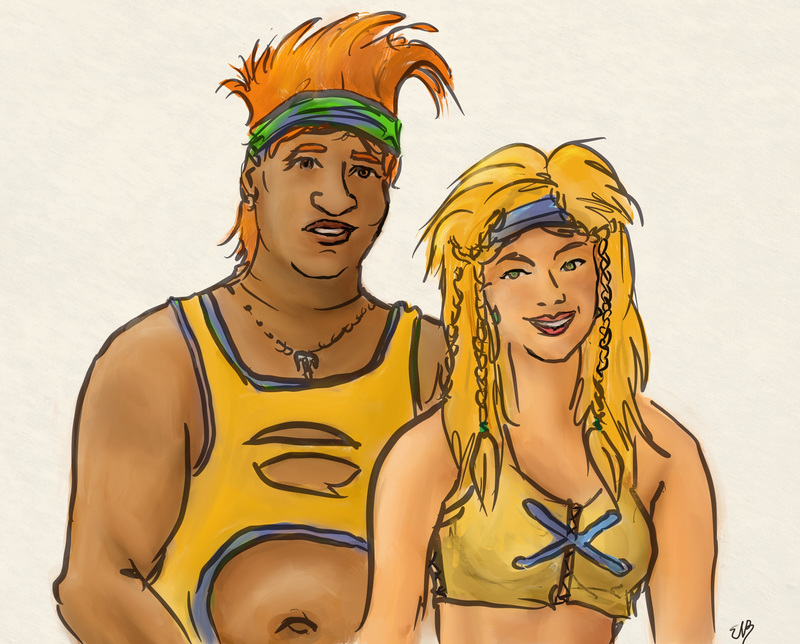 Our Story So Far: On a rampage to destroy the temples of Yevon, Sin transports Isaaru and companions to Bikanel Island, where Wakka and Rikku are raising a family. Gippal gives Rikku and Isaaru's party a lift to Baaj to the south, where Sin has just attacked the new Al Bhed Home. I nearly titled it "Driving Miss Lulu." Yikes. I just stumbled across this gap-filling snippet in my writings file. I don't think I ever posted it, because it seems a little unfinished, but I feel like sharing it. Title: Rikku & Lulu Snowmobile Ride. Summary: Reconstructing the convo between Lulu and Rikku, if the player gets the Auron & Tidus snowmobile sequence.